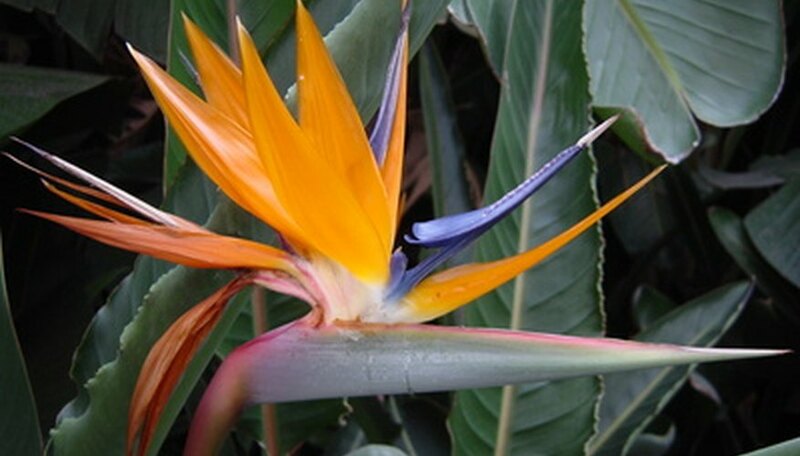 The plant known as Strelitzia reginae is commonly called the bird-of-paradise or crane flower for its showy orange and blue flowers that resemble an exotic bird. It originated in South Africa and has been introduced to many areas of the world. It’s important not to eat the seeds because they can cause adverse health effects. The bird-of-paradise plant has leathery, strap-like leaves that grow in 3 to 5 foot clumps from a central base. The evergreen leaves are at least 6 inches wide and can grow to 2 feet in length or longer. The flowers resemble colorful birds in flight, making this plant an important one in the cut flower industry. Its leaves are also used as greenery in flower arrangements. Belonging to the banana plant family, Musa, the bird-of-paradise can endure temperatures down to 24 F for short periods of time. A feeling of dizziness is one of the first noticeable effects that bird-of-paradise poisoning can cause. When dizziness strikes, you can feel weak or as if you’re about to faint. You might also become confused, nauseous, tired or a combination of these symptoms. Light-headedness is another term for dizziness. You might need to sit down for fear of falling over due to a lack balance. Other symptoms of dizziness include headache, changes in vision or loss of eyesight, dry mouth and a ringing in the ears. If you eat the seeds or the angled seed capsule of the bird-of-paradise plant, internal poisoning can occur, according to the government of Alberta, Canada. Vomiting is one of the symptoms these plant parts can cause. The seeds also cause poisoning in dogs and other animals that eat them. If dogs eat bird-of-paradise seeds mild vomiting can occur. The Pet Owner’s Guide to Toxic Plants reports that the seeds of this plant are minimally toxic. Consuming bird-of-paradise seedpods or seeds can also cause diarrhea, both in humans and animals. When diarrhea occurs, cramping and bloating can occur and the stools become loose and watery. Bowel movements can occur three or more times each day. Severe cases of diarrhea can deplete the body of fluids and cause dehydration, which can result in a serious medical condition requiring prompt medical treatment. Antibiotics might be needed. When a dog has diarrhea due to consuming bird-of-paradise seeds or other toxic plants, it will stop eating and its energy level will drop. Consult your veterinarian if this should happen. If you should feel overly tired after eating bird-of-paradise seeds, drowsiness can be one of the symptoms these toxic plant parts cause. Daytime sleepiness is not a normal condition for most people if they get sufficient nighttime sleep and are in good general health. Because bird-of-paradise seeds are considered only minimally toxic, the feeling of drowsiness should pass. If it does not, and if diarrhea, vomiting or dizziness accompanies it, be sure to seek medical attention. Which House Plants are Poisonous for Dogs?